Having picked up the BAFTA New Talent award for his short film It’s About Spending Time Together in 2012 and the Best Short Animation prize in 2013 for the playful animated mockumentary The Making of Longbird (which he co-wrote with White Robot partner Will Anderson), writer/director Ainslie Henderson is becoming a bit of a regular at the UK’s biggest film awards. Narrowly missing out on yet another BAFTA yesterday, when it was beaten to the Best Short Animation trophy by Yousif Al-Khalifa’s Sleeping with the Fishes, Henderson’s most recent short I Am Tom Moody takes us on an emotive journey into the conflicted mind of an aspiring musician. A film about how the things that we’re scared of stop us from doing the things that we want to do, I am Tom Moody is the tale of an amateur entertainer as he takes to the stage on open mic night at the Egg and Sparrow pub. Transporting us into the mind of this nervous musician as he battles his internal feelings of apprehension and self-doubt, the majority of Henderson’s film plays out in the protagonist’s mindspace, as a fevered debate rages between the two conflicted voices in Tom’s head. Taking us back to events in his life that triggered these feelings of unease, before bringing us back to the present where we witness the troubled performer unravelling in front of an unseen audience. Tom has to decide whether to confront his inner voice or give in to his fears. With his own admissions of self-doubt throughout production and a background in music, its not hard to see that the narrative of I Am Tom Moody is a personal one for the director. 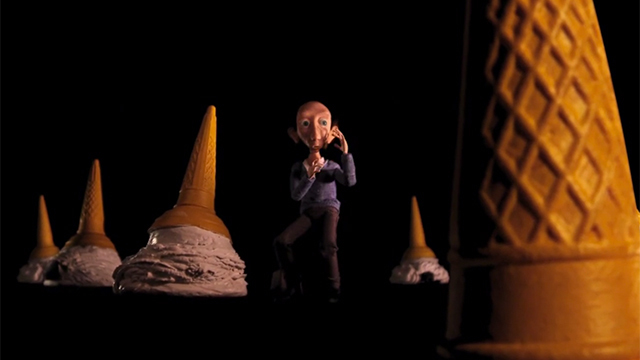 Created as his University of Edinburgh graduation film, the animator admits to being drawn to stop-motion because he finds a particular magic in that medium and it’s certainly a format well-suited to his story. Yet, whilst the technique on show in Henderson’s short is impressive, it’s in the story and the script where the real magic starts to happen. Funny and touching in equal measures, this tale of insecurity rapidly engulfs you in the internalised universe of Tom Moody with it’s snappy dialogue and affecting plot. Firmly placing you in the headspace of its protagonist as his imagination runs wild, Henderson’s well-written short perfectly captures the claustrophobic, dizzying effects anxiety sufferers will be all to aware of. With the success of his film laying largely in the hands of his off-screen cast, Henderson had two masterstrokes when it came to finding the voices of Tom and Young Tom. Searching for someone with the vocal talents to bring to life the parts of his protagonist that are deeply insecure and stuttering, but also really aggressive and domineering, the director called in an old friendship with actor Mackenzie Crook to to provide both the actual and inner voice of the titular Tom Moody. Breaking away from the typecasting he’s experienced following his successful performances in British comedy series The Office and the fantasy genre (Crook is probably most recognised nowadays for his roles in the Pirates of the Caribbean franchise and the Games of Thrones television adaptation), the underrated actor continues to expand on his acting resume with this impressive vocal performance. With no-one lined up to play young Tom in his film, Henderson pulled off his second casting masterstroke by roping in Crook’s son Jude to provide the child voice of his titular character. Bringing just the right amount of childish uncertainty to his performance, Jude’s unforced rawness gives a believability to the juvenile Tom that probably wouldn’t have been possible from someone more experienced in the world of acting. Amen to the 10 hour prayer of a puppet, a camera and a dark room. From quoting Carl Jung and declaring a sense of profound joy on his blog to revealing his love for the relaxing, mechanical nature of stop-motion in his ‘Making Of’ video, it’s clear Henderson is most content at work in his chosen medium. Currently working on new film Monkey Love Experiments, once again with Will Anderson, this new project combines stop-motion and live-action and has been described by the filmmaker as a short that is dark and sad, with a twisted sense of humour – we’ll look forward to seeing it in the BAFTA nominations in 2015.